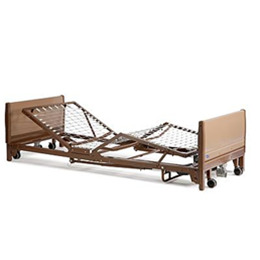 Invacare brings the safety and convenience of a low bed into the Homecare Bed Series with the Invacare Hospita Bed. The split-spring design incorporated into the standard low bed profile combines the easy, one-person delivery of an Invacare bed with the benefits of a low bed, most often used when injuries from falling out of bed are a concern. The Low Bed ends are fully compatible with existing Invacare full-electric bed frame inventories and the drive shaft, simplifying inventory management for providers.